Lamrock wrote: Damn Philly got a game on you?! Fire Begley! mp3 wrote: How young does Pau look! No doubt. He should look a bit older in any future screenshots though, as I've got artwork from more recent rosters installed at the moment (hence the Sixers' jerseys being up to date in those screenshots). Great start to the Finals. Who needs home court advantage anyway? I thought I might after that first quarter, but they ran out of steam in the second half. I'm interested to see whether Gasol will make things a bit more challenging. Wow, 2007! Superb job getting to the Finals once again, 'Drew! 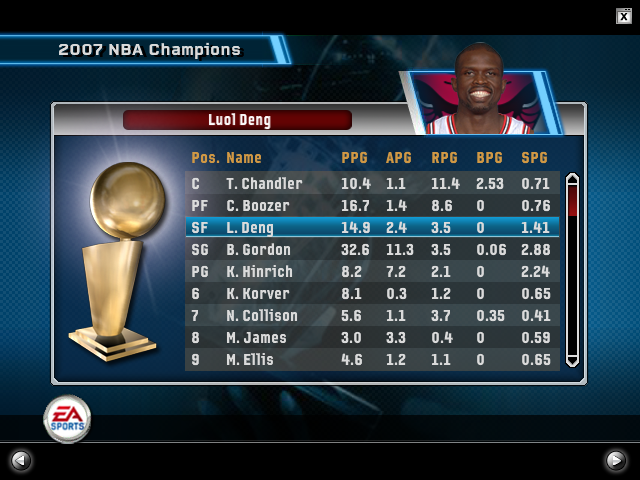 The rest of the 2007 NBA Finals, including a video and some additional screenshots! Offseason updates to follow. The good news for the Memphis Grizzlies: Pau Gasol is back in the line-up. The bad news: the Chicago Bulls are rolling right now. Chicago scored the first ten points of the game and never looked back. Although a quick run allowed Memphis to close the gap and remain close for part of the first quarter, the lead soon ballooned and the Bulls had the game well in hand by halftime. Gordon scored 15 of his game high 31 points in the first two quarters as the Bulls shot 57.8% from the field, compared to a dismal 34.8% by the Grizzlies. Gasol insisted that he isn't feeling the effects of the rib injury that he sustained against the Phoenix Suns in the Western Conference Finals, but often looked tentative on offense, and ended the game with just eight points. He did make a significant contribution on the boards however, collecting 10 rebounds. Eddie Jones led the Grizzlies with 17 points in the loss, also adding three rebounds and four assists. The impressive play of Tyson Chandler no doubt played a large role in keeping Gasol and the Grizzlies at bay. Chandler had a game high 17 rebounds and blocked seven shots, while also scoring 12 points. Luol Deng and Carlos Boozer also helped shoulder the scoring load for the Bulls, with 17 and 16 points respectively. 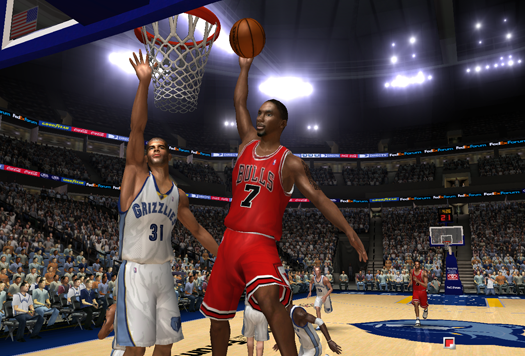 MVP Ben Gordon had 10 assists, three rebounds, and three steals to go along with his 31 points, and scored 13 fourth quarter points as the Bulls enjoyed a 34-22 advantage in the final period. With a 2-0 lead in the NBA Finals, the Bulls now return to Chicago, where they will hope to sweep their way to a second consecutive championship. It's been a season of records and statistical feats for the Chicago Bulls, so it seems only appropriate that they'd add at least one more to the list before the year is through. The Bulls crushed the Memphis Grizzlies 126-75, the 51 point advantage setting a new mark for the largest margin of victory in NBA Finals history. 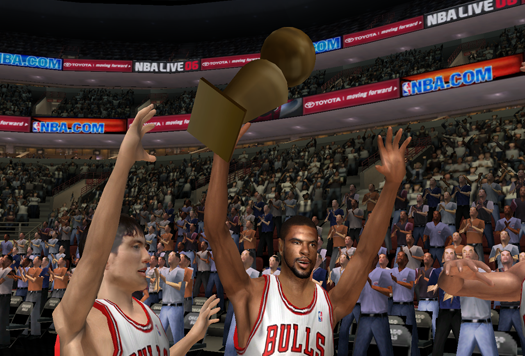 Chicago also held the previous record of 42, set in Game 4 of the 1998 NBA Finals against the Utah Jazz. Another quick start by the Bulls saw them lead the game 25-17 after the first quarter, before blowing it wide open in the second quarter. Chicago shot a blistering 70% from the field in the second quarter, outscoring Memphis 42-16 and firmly taking control of the game. By the end of the third quarter, the lead was at 40. Even as the Bulls' starters exited the game for good with 5:55 remaining, Memphis was unable to make a dent in the lead, ultimately finding themselves on the wrong end of history. Pau Gasol appeared to be more aggressive, scoring 15 points and grabbing 13 rebounds, in addition to handing out three assists. Mike Miller top scored for the Grizzlies in the loss, talling 18 points, while Damon Stoudamire had 10 points and four assists. 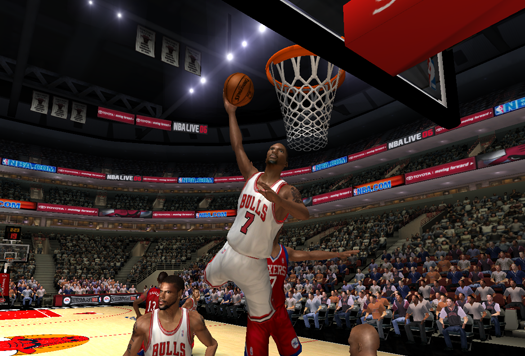 The Bulls did an amazing job of sharing the basketball, racking up 24 assists by halftime, and 44 by the final buzzer. Three Chicago players ended up with double digit assists, with Ben Gordon dishing out 12, Kirk Hinrich handing out 11, and Mike James totalling 10. Gordon also added a game high 34 points, Hinrich had 11 points to complete a double-double of his own, and Luol Deng and Carlos Boozer each scored 16, with Boozer also grabbing 12 rebounds. Tyson Chandler was once again a force inside, with 16 points, 16 rebounds, and five blocks. Chicago will now attempt to complete a sweep of the NBA Finals for the second straight season, with a chance to capture the team's eighth championship in Game 4 at the United Center. The sweep is complete, and for the second year in a row, the Chicago Bulls hoisted the Larry O'Brien trophy in the United Center. 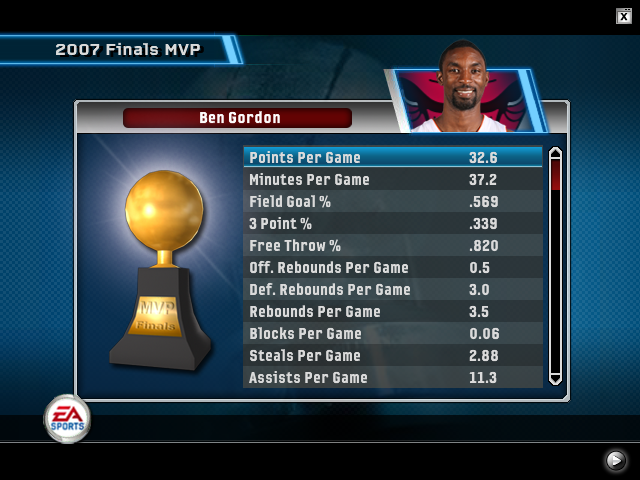 Ben Gordon was unsurprisingly named NBA Finals Most Valuable Player, scoring 38 points including 24 in the first half, as well as tallying five rebounds, 11 assists, and two steals in the Game 4 victory. With their backs against the wall, the Memphis Grizzlies opened the game with an aggressive run, and it seemed as though the Bulls would have a tough battle on their hands. Gasol in particular was more assertive, finishing with 20 points and seven rebounds, while Mike Miller poured in 27 points, including 17 in the first half. The game would once again slip away from the Grizzlies in the second quarter however, as the Bulls outscored them 30-23 to take a 59-47 lead into halftime. Although the game did not ultimately get out of hand, the Grizzlies were unable to erase the Bulls' lead, as Chicago once again enjoyed a balanced attack. Luol Deng had 13 points, four rebounds, and five assists, Carlos Boozer added 16 points, and Tyson Chandler had another double-double with 10 points and 13 rebounds, in addition to six blocks. Monta Ellis and Nick Collison came off the bench to score 9 and 8 points respectively, while Shawn Kemp, likely playing in his last NBA game, had four points and eight rebounds. Beyond Miller's team high 27 and Gasol's eight fourth quarter points, few other Grizzlies players had standout performances, aside from Damon Stoudamire who finished with 17 points and seven assists, scoring ten points in the third quarter. 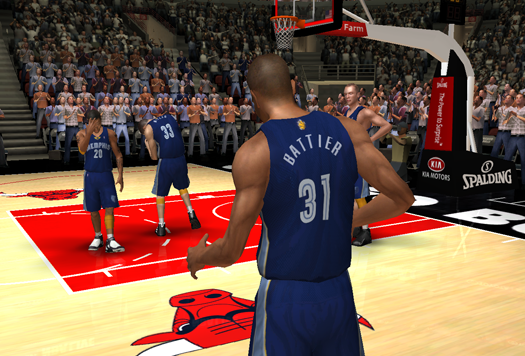 The Bulls dominated the Grizzlies on the boards 45-30, enjoying a 15-4 advantage at the offensive end. "I'm extremely proud of this team," Bulls coach Andrew Begley said after the game. "We wanted to prove a point this season, and show that last year wasn't a fluke. I think we've done that." Grizzlies coach Mike Fratello certainly seemed to agree. "We had a great year, but they're something else," he commented. "We're going to pick ourselves up, because we want to be here again next year. But congratulations to them." It will be an interesting offseason for the Bulls, as they intend to pursue some of the league's top free agents as they re-group for a shot at a third straight NBA championship. Way to cap off the season and the playoffs! Thanks guys. I know that a dominant season isn't always fun to read about, but I was eager to finish this one off in style. I'm thinking that I'll continue this one on the side, so I'll see if I can make it a bit more competitive. 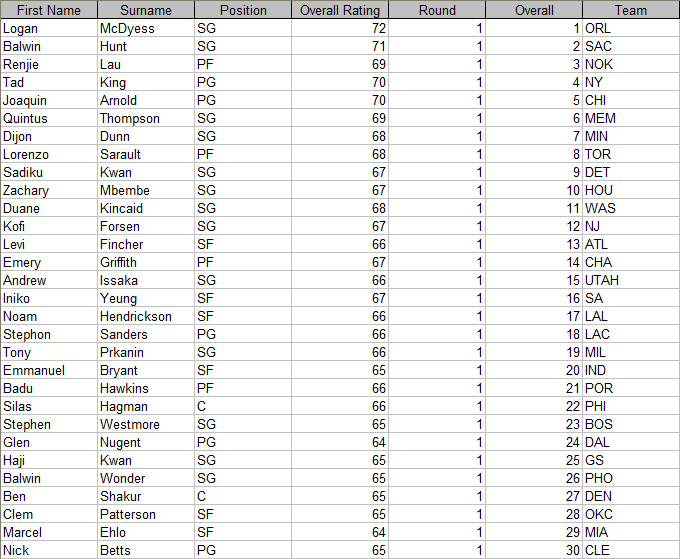 I'm already on Superstar difficulty, so some sliders may need to be adjusted. I'm also thinking that I'll change up my presentation a little. I probably won't recap every game in detail anymore, but I'll post scores and stats, and highlight certain key games and significant performances. The Grizzlies never stood a chance! Ten years after the second threepeat. It does seem appropriate. A three-peat is definitely on the books. 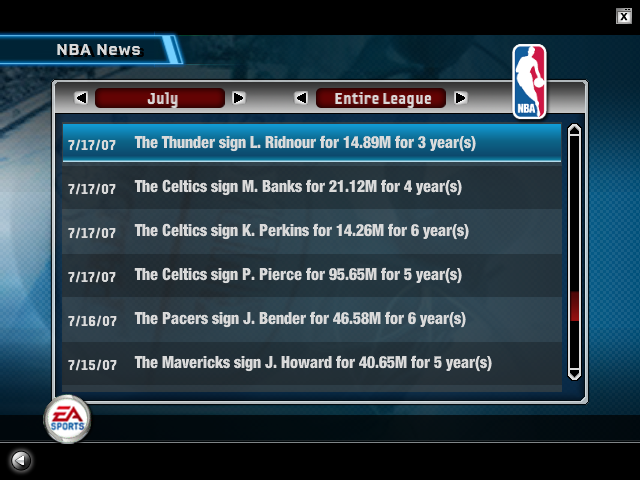 Note: Somehow, I ended up with the fifth pick. I believe I glitched things when I edited some of the team names during the season, to match the art from the latest roster update. However, you know what? The Bulls did have a lottery selection that year (Joakim Noah in reality), courtesy of the New York Knicks via the Eddy Curry trade. 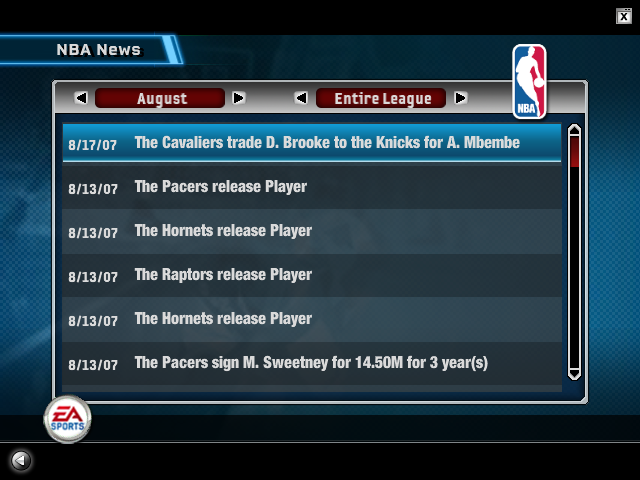 So let's write that into the story, and pretend a few other trades have taken place, too. NEW YORK, NY -- The 2007 Draft was projected to be a weak one, and at a glance, seems unlikely to produce many superstars. However, the Orlando Magic are hoping that top pick Logan McDyess will help fill the void left by Tracy McGrady when he was dealt to the Houston Rockets two years ago. The biggest winners of the Draft may be the Chicago Bulls and Memphis Grizzlies. The two teams, who just wrapped up their clash in the NBA Finals, owned the fifth and sixth picks respectively, owing to trades that have certainly worked out in their favour. 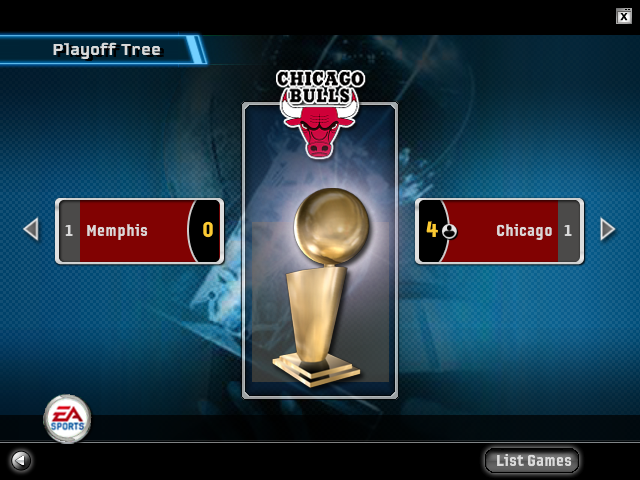 The Bulls selected point guard Joaquin Arnold, while the Grizzlies drafted Quintus Thompson, a shooting guard. It remains to be seen whether Arnold will replace Kirk Hinrich in the Bulls' starting line-up, or play behind him off the bench. TORONTO, ON -- In an offseason that saw most key free agents stay put, Carmelo Anthony will be taking his talents north of the border to the Toronto Raptors. Melo joins fellow Class of 2003 Alum Chris Bosh to form what should be a formidable frontcourt duo. It was a busy offseason for Toronto, who not only re-signed Bosh and lured Melo to town, but also retained Jose Calderon and acquired Maurice Williams to shore up their backcourt. The Raptors also acquired the services of C.J. Miles, a promising young swingman. Anthony was also courted by the Philadelphia 76ers and the two-time defending champion Chicago Bulls, but ultimately chose the more lucrative deal offered by the Raptors. The move reportedly came as a shock to the Denver Nuggets, who had expected to retain the services of their All-Star forward. "He'll be under intense scrutiny this season," an anonymous source close to the proceedings commented. "He chose money over joining a team poised for a threepeat, not to mention the team that drafted him. There are a lot of fans who aren't happy with him right now, who will be very eager to boo him." With the Raptors' re-loaded roster, it is expected that the whole team will be under the microscope, as expectations are now running high in Toronto. CHICAGO, IL -- Although he just helped them win back-to-back championships, Kirk Hinrich wasn't sure if he would remain a Chicago Bull. The team renounced his rights in an effort to chase a high profile free agent such as LeBron James or Carmelo Anthony, but ultimately ended up using their cap space to retain their starting point guard. "No hard feelings...I'm here, aren't I?" Hinrich said. "I understand that it's a business, and we wanted to do everything we could to get even better. Management was always very open with me about their plans, and insisted that they wanted to re-sign me if possible. I'm here, and I want to be a part of a threepeat." The Bulls likely will not be players in the free agent market for some time, as NBA Finals Most Valuable Player Ben Gordon and starting forward Luol Deng will be seeking large contracts in the forthcoming offseason. The Bulls have instead been able to shore up their roster with Joaquin Arnold, the fifth selection of the 2007 NBA Draft, a pick the team received from New York in the Eddy Curry trade two years ago. CLEVELAND, OH -- The Decision has been made: Cavaliers fans can breathe a sigh of relief, as LeBron James will remain in Cleveland. The superstar forward re-signed with his hometown team for six years, and thus will not likely be headed anywhere else anytime soon. "This is a great day for the city of Cleveland," team owner Dan Gilbert remarked. A billboard celebrating the re-signing has been put up downtown, though it has drawn some mockery for its unusual usage of the Comic Sans font. Nevertheless, the Cavaliers are poised to once again be one of the top teams in the East. A round-up of all the offseason moves. CHICAGO, IL -- Veterans Shawn Kemp and Steve Smith have announced their retirement from the NBA. Both were members of the 2006 and 2007 Chicago Bulls championship teams, with Kemp re-establishing himself as a starter during the first championship season. "I am very grateful for my two years in Chicago. The Bulls took a chance on me, and provided me with a wonderful opportunity to end my career on a high note," said Kemp, a former multi-time All-Star who spent the 2007 season backing up Tyson Chandler at centre. "Just a great experience." Steve Smith echoed the sentiments, despite playing limited minutes during his stint in Chicago. "To be a part of two championship teams was really something special," he said. "Thank you to the entire Chicago Bulls organisation." A spectacular player early in his career who found success despite not playing college basketball, Kemp played sixteen years in the NBA, including eight with the Seattle Supersonics, three with the Cleveland Cavaliers, two with the Portland Trail Blazers, one with the Orlando Magic, and two in Chicago. Smith, a standout player at Michigan St, was drafted by Miami in 1991 and spent his first three and a half seasons with the Heat before being traded to the Atlanta Hawks, whom he played for from 1994 to 1999. He also played for the Portland Trail Blazers, Charlotte Bobcats, New Orleans Hornets, and San Antonio Spurs, with whom he won a championship in 2003. NEW YORK, NY -- The NBA salutes the following players, who have decided to hang up their sneakers! Good lord! The contracts are really fat. It was an interesting offseason for the Chicago Bulls. While they failed to make a big splash in the free agent market, they did draft a promising point guard with the fifth overall pick, retained Kirk Hinrich, and are bringing back several other key players from last year's team that went 77-5 in the regular season and stormed through the Playoffs on route to a second straight championship. However, their decision to maximise their cap space did force them to renounce the rights of Mike James, who often provided a spark off the bench. It remains to be seen whether rookie Joaquin Arnold can step into his shoes and provide the same kind of production in his first NBA season. With the retirement of Shawn Kemp and Steve Smith, the Bulls have also chosen to round out their roster with several undrafted rookies: guards Rufus Daly and Sergio Tschirner, forward Raymond Payne, and centres Wallace Orr and Chiyo Mah. They also selected forward Rasmus Brylin with the 33rd pick of the Draft, giving them a total of seven rookies on the roster. It's an unconventional approach for a team that is seeking a third consecutive championship, but the Bulls are confident. 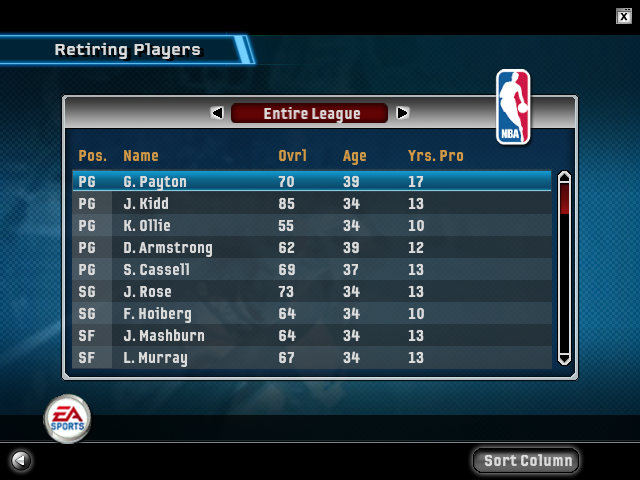 Ben Gordon, last year's Finals MVP, has looked even better so far in the pre-season. Tyson Chandler, a force inside against the Memphis Grizzlies in last year's Finals, is once again the man in the middle. Luol Deng, Kirk Hinrich, Carlos Boozer, and Kyle Korver are all returning, as is Monta Ellis. Eddie Gill is also a holdover from last year's championship team, though he played sparingly. "We've got a different look, but we haven't lost our confidence," Gordon assured reporters on media day. "Remember, we weren't supposed to win in 2006. Then that was supposedly a fluke. We have high expectations for ourselves this year." Commenting on the team's attempts to sign a marquee free agent, coach and president of basketball operations Andrew Begley said "It's no secret that we went out and tried to get a couple of guys we thought could make us even better. For various reasons, we couldn't make that happen, but we've brought back Kirk, we still have most of our core from last year. We have a rising star in Ben. We have some promising young players added to the mix this year. We're up to the challenge." Most pundits appear to be favouring another championship victory for Chicago this season, but they will certainly face some challenges with their unusual roster, not to mention newly emerging powers in the East such as the Toronto Raptors, who acquired Carmelo Anthony and Maurice Williams during the offseason. The Melo signing certainly stings for the Bulls, who had made their own overtures towards the former Denver Nugget. "We're not thinking about that," Carlos Boozer insisted. "Me, I'm just happy that most of us are back, and are ready to do it all over again." 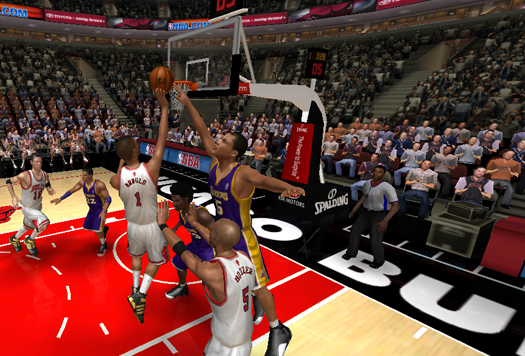 The Bulls will tip off their season at home on October 29th, where they will take on the Los Angeles Lakers. KevinParker13 wrote: Good lord! The contracts are really fat. Before the season began, there were questions as to whether fifth overall pick Joaquin Arnold would be able to fill the shoes of veteran point guard Mike James, a key backup in the Chicago Bulls' championship run last season. It's only been one game, but so far, so good. The Bulls withstood several runs by the Los Angeles Lakers and overcame an injury scare for star guard Ben Gordon as they opened the 2007/2008 campaign with a 116-99 victory. With Gordon missing most of the third quarter after taking a hard shot to the ribs, and Kirk Hinrich on the bench with foul trouble, Arnold stepped up to the challenge. The rookie finished with a double-double in his debut, tallying 13 points and 10 assists, to go along with a steal and two rebounds. Despite being limited to just 30 minutes, Gordon was still effective, with a game high 24 points, 10 assists of his own, three rebounds, and three steals. Tyson Chandler registered a double-double with 12 points and 12 rebounds to go along with two blocks, while Luol Deng and Carlos Boozer contributed 16 and 13 points respectively. Rasmus Brylin, another rookie making his debut, had 12 points off the bench. With All-Star guard Kobe Bryant hampered by foul trouble throughout the night, the Lakers got a lift from an unexpected source: Kwame Brown. The former first overall pick scored a team high 23 points and snared nine rebounds, but was scoreless in the fourth quarter. Kobe and Lamar Odom combined for 21 points in the final period as the Lakers made one last valiant run, but the Bulls managed to keep them at bay. Gordon did return to action in the fourth quarter, and while he admitted to being sore after the game, x-rays were negative. He is not expected to miss any time. Notes: The battle on the boards was tied at 38 apiece...the Bulls committed just 11 fouls, while the Lakers were whistled for 25...the Bulls shot 22/24 from the free throw line, while the Lakers were just 6/9...Ben Gordon's 92 point quadruple-double performance came against the Lakers last season. CHICAGO, IL -- Bulls fans in the United Center held their breath last night as Ben Gordon left the game early in the third quarter after taking a stiff shot while trying to block a lay-up by Sasha Vujacic. X-rays were negative, and Gordon ultimately returned to the game in the fourth quarter, scoring 6 of his 24 points as the Chicago Bulls defeated the visiting Los Angeles Lakers 116-99. Team doctors have confirmed that Gordon is suffering soreness in his ribs, but he is currently listed as being day-to-day, and is not expected to miss a significant amount of time. Gordon himself insists that he will be in action tonight against the Utah Jazz, but will likely be a game-time decision. Yeah, I'd forgotten about that bug. It's a shame that you couldn't land Melo. That would have been cool. At least you kept together that solid starting group and added a promising young point guard. Yeah, it was a shame I couldn't make any significant moves. At least I was able to retain Captain Kirk, it would've been a pretty slim roster without him! I'm definitely liking the Arnold pick. My plan was to divide up the minutes fairly even between him and Hinrich, but when I committed a couple of careless fouls with Kirk and decided to sit him and see what Joaquin could do, it turns out that he's pretty good. He's quicker than Hinrich, so he can really push the ball. Assigning him #1 is obviously a nod to Derrick Rose (coincidentally, he even kind of looks like he did as a rookie, as much as a generic face can). I've given the other rookies numbers that correspond to current Bulls, somewhat based on their skillsets. I'll have to change Brylin's number if I end up trading for Gasol halfway through the season, though. 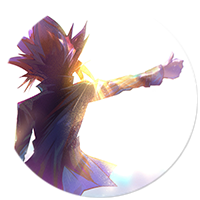 I'm trying something new, with a featured game and mini-recaps for the other games I play. 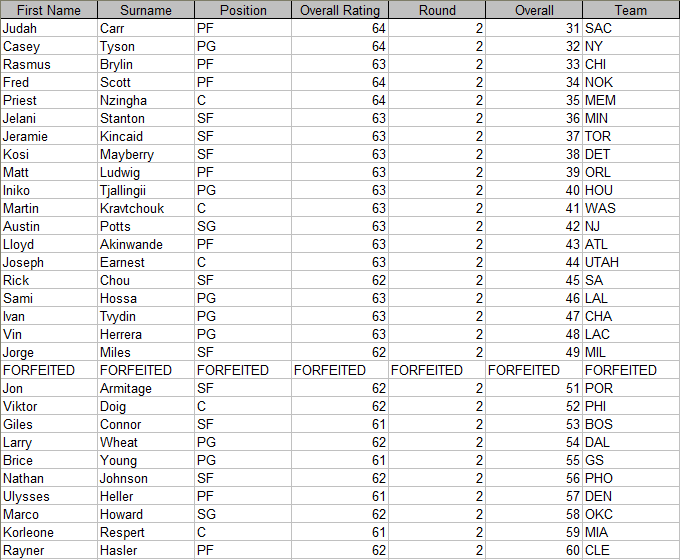 I'll be posting full boxscores throughout the regular season, even for the games I don't recap. 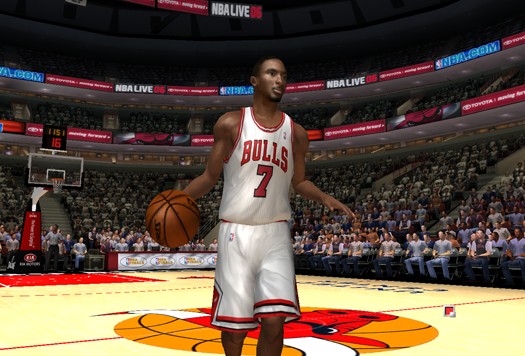 Although he was originally expected to play, Ben Gordon was a late scratch and did not dress for the game. Joaquin Arnold registered the first start of his NBA career. Arnold is the first player to register a 20 point, 20 assist game since Jalen Rose in the 2001 season, and the first rookie since Kevin Johnson in 1989. Denver led at the end of each of the first three quarters, a rarity for a Chicago opponent dating back to last season. Ben Gordon scored 30 of his 36 points in the second half. Denver shot 50.6% from the field, while Chicago shot 45.2%. The rebounding battle was tied at 48 boards apiece. For the second straight game, Ben Gordon scored 36 points. This time, however, he did so far more efficiently. After a rough night shooting the ball in the Chicago Bulls' previous victory over the Denver Nuggets, Gordon was a blistering 14/18 from the field in Chicago's 113-80 triumph over the Philadelphia 76ers. With the game well in hand, Gordon did not play in the fourth quarter, though still tallied 10 assists, four rebounds, and three steals to go along with his game high 36 points, in just 31 minutes of court time. Allen Iverson led the Sixers with 22 points, shooting a reasonable 9/20 from the floor. Philadelphia was only the team to take a win from the Bulls in last year's postseason, and it appeared as though Chicago had not forgotten about the blemish, as they raced out to an early lead and never looked back. "They still felt like they had a point to prove," AI asserted after the game. The former MVP also had four rebounds, four assists, and two steals in the loss. Rookie Joaquin Arnold came off the bench for the Bulls after starting the past two games, contributing 11 points and eight assists, but also had seven turnovers. Arnold is leading the team in assists following his remarkable 20-20 game against the Utah Jazz, and is currently averaging 11.5 per game, but is also committing a team high 6.3 turnovers per contest as he adjusts to the NBA. Nevertheless, he has shown a lot of promise in the first four games of his NBA career. Arnold is expected to split time fairly evenly with Kirk Hinrich at point guard, and may well find himself in the starting line-up permanently before the season is over. 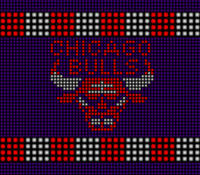 At times, the Bulls played Arnold alongside Kirk Hinrich with Gordon moving into the frontcourt alongside Luol Deng. Anchored by Tyson Chandler in the middle, the small-ball line-up proved quite effective at pushing the ball up the floor, but did give up a lot of height at the defensive end. 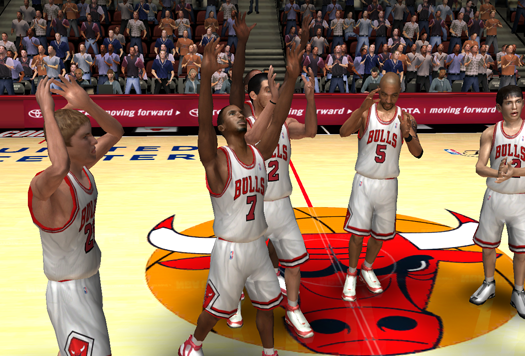 Five Bulls scored in double digits, as Chandler, Deng, and Carlos Boozer each had 12 points. Chandler also had a team high of nine rebounds and two blocked shots. Samuel Dalembert had a double-double for the 76ers with 13 points and 11 rebounds, in addition to four assists and a block. Notes: Tyson Chandler is yet to register an assist this season...Chicago won the battle of the boards 45-40...the Sixers shot just 37.2% from the field, compared to Chicago's 53.4%...Kyle Korver completed a four point play early in the fourth quarter, off an assist from Joaquin Arnold...sophomore Cory Camara accounted for nine of the Sixers' 18 turnovers. He was also 1/14 from the field. CHICAGO, IL -- Seldom-used Chicago Bulls point guard Eddie Gill appeared as though he may be in line for some more minutes this season, before an awkward fall late in the Bulls' 110-96 victory over the Utah Jazz resulted in a badly broken hand. Gill is expected to be out of action for at least ten weeks. A member of last year's championship team, Gill appeared in 40 games during the 2006/2007 regular season, and eight Playoff games in the Bulls' march to their second straight title. Joaquin Arnold seems to be doing quite well. Not many players can boast a 20 point-20 assist game. To do it as a rookie is pretty cool. 20-20 for the rook? Damn.